One Direction (commonly abbreviated as 1D) are an English-Irish pop boy band based in London, composed of Niall Horan, Liam Payne, Harry Styles, Louis Tomlinson, and previously, Zayn Malik until his departure from the band on 25 March 2015. The group signed with Simon Cowell's record label Syco Records after forming and finishing third in the seventh series of the British televised singing competition The X Factor in 2010. Propelled to international success by social media, One Direction's five albums, Up All Night (2011), Take Me Home (2012), Midnight Memories (2013), Four (2014), and Made in the A.M. (2015), topped charts in most major markets, and generated hit singles including "What Makes You Beautiful", "Live While We're Young", "Best Song Ever", "Story of My Life", and "Drag Me Down". Today we collect the votes and their choices, and get the next top 10 best music songs in their opinion. The boys are no stranger to Fleetwood Mac's influence (see: "Fireproof"), but on the hypnotic "What a Feeling," the band goes full "Little Lies" as their harmonies sync up on the track. The Made in the A.M. song also has a nod to "Dreams" with its bass line, making for one of the smoothest and most retro songs on the album. "I was so mad when I first heard that song," recalls frequent 1D co-songwriter and producer Julian Bunetta. "I was so pissed off because the chorus was so good. I was just jealous. The harmonies on that song ... I've had so many nights at my house having little dance parties to that song." "Drag Me Down" was not only the lead single off of Made in the A.M., but it was also the group's first track without member Zayn Malik. You hardly notice the missing link on this feisty, power-pop banger that has the band going a little electro-rock and even more anthemic than the oft-intimate cuts on previous album Four. The catchy, quirky "Never Enough" is one of a few songs on Made in the A.M. to feature a writing credit from the band's lone Irishman Niall Horan, who takes an even bigger role on the LP than ever before. Beginning with some interesting vocal work from the group — that's slightly reminiscent of Blue Swede's "Hooked on a Feeling" — the song builds towards a massive, stadium-ready pop-rock chorus. This Four deep cut has had quite an interesting life. The song was an immediate hit with Directioners, showing the group's most palpable musical maturity yet on the driving track. Fans were shocked when it wasn't chosen as a single and decided to take matters into their own hands by launching a social media campaign earlier this year to have the alt-pop track hit radio airwaves. In the end, they got "No Control" to trend worldwide and hit Number One on the Billboard Twitter Real-Time chart, where it held down the top spot for some time. "Fireproof" was the first song to be previewed from the band's Four and was initially released as a free download on the day they announced the album's name and cover art. The track was a great indicator that the band would stick with its most successful experimentation from Midnight Memories: adopting the influence of Seventies soft-rock. The sweet, harmonious track set a strong, confident tone for the album and for the bandmates as songwriters. This folky Four ballad saw the band take on some darker themes in their love songs as they sing about sticking with an empty relationship for the sake of feeling wanted. The ballad is one of 1D's most bittersweet. "Night Changes" is the last official 1D single to feature Zayn Malik and represents the group in peak boy-band form as it relays the values of living for the moment and celebrating youth. The romantic song follows in the thematic footsteps of the track "Live While We're Young," but it showcases just how much more mature the group has gotten in delivering its carpe diem message. "'Olivia' was Harry's genius," frequent collaborator Julian Bunetta told Rolling Stone earlier this month. The tune is a perfect little reference to the Beatles' Sgt. Pepper era as it hits the playfully sung "I love you Olivia." The Made in the A.M. song has a campfire sing-along quality that gets just theatrical enough in its pining lyrics and delivery. Paul McCartney would surely be flattered by the boy band's nod to his songwriting. 9. "Story of My Life"
"Story of My Life" was the band's biggest public turning points and showed off just how much the boys then best-known for the bubblegum track "What Makes You Beautiful" had turned into a rock-tinged, power-pop quintet. Above an acoustic guitar, the group became its most reflective while contemplating a bad romance. One Direction's newfound maturity rang out beyond just their superfans — "Story of My Life" helped transition the group into something bigger than a teen pop phenomenon. Of all the songs on the band's third album Midnight Memories, "Through the Dark" may be their most Mumford moment. The song builds up to a regular folk stomper, especially as they harmonize on the sing-along-ready chorus. When the group sang it on Saturday Night Live while clad in mostly black clothing, they solidified that their genre-turn was more than just an experiment or a gimmick. The Whole top 10 best songs you can download or purchase from iTunes Store, you can also stream them from Apple Music, or download them offline. Here we show you how to convert downloaded Apple Music songs to MP3 format..
To convert the downloaded Apple music songs to MP3 format quickly, you need to free download and install Macsome iTunes Music Converter, which supports so excellent solution to convert all your iTunes playlist, both music and audiobook files. Step 1, Open your iTunes Music Converter, click "+" button, and find your whole music album of La La Land. And then select all the audio files and click "OK" button to add them. Step 2, after you add these music files, now you can click the setting icon to set the output format and output folder. Except MP3 format, you can also convert these music files to AAC, FLAC, WAV as you like. 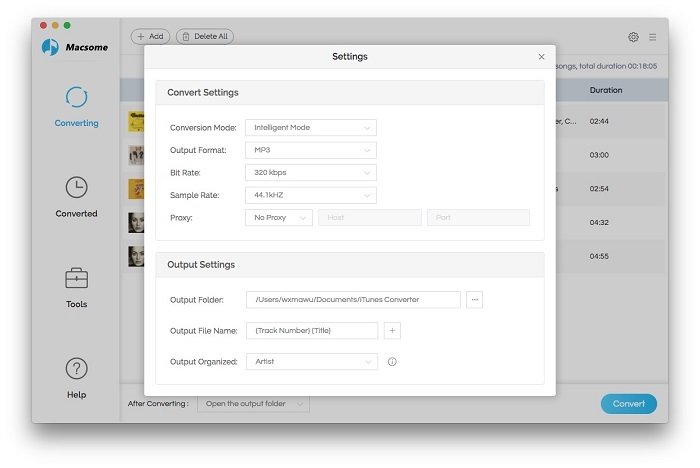 Step 3, After the above steps settings, you can click "CONVERT" button to start. 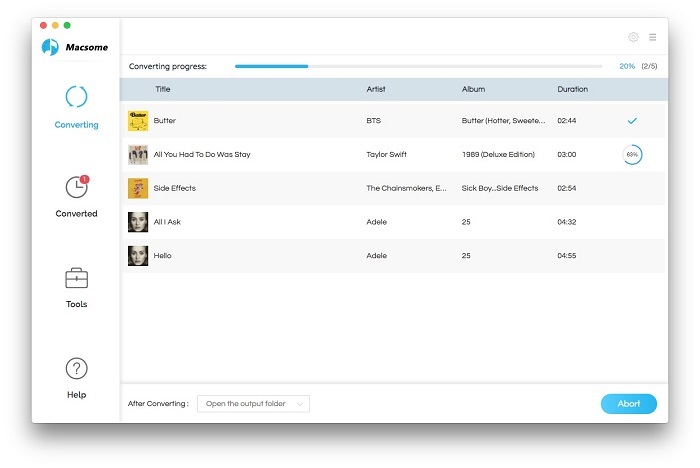 After the conversion, you can open output folder to find the converted music files in the format of MP3, And then you can transfer them to your MP3 player quickly.